so when you get a baby monitor, it’s most likely gonna fall into one of four categories. The first is as a traditional sound. 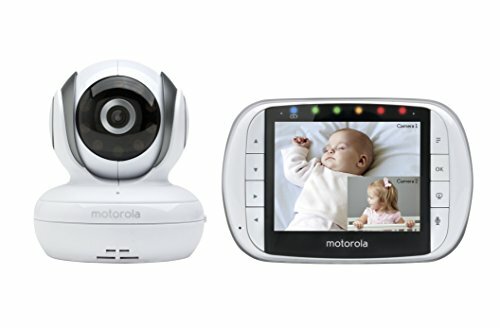 the second one being a video monitor that comes with a dedicated screen, the third one is a video monitor where your screen is your phone, and then the fourth being a sensor worn on the baby or around the baby while he or she is sleeping. We are going to try to go through the pros and cons of all those categories and list the best products in each category with a detailed and unbiased review. Finding the best baby monitor for your baby in 2019 could be a hard task. So stick around as we are going to dive into these products in order to provide the best one for you. 1. VTech baby monitor – cheapest baby monitor with sound only. Here is a table where we summarize the best ones you can find in the market right now. We all worry about our babies that is why we seek to find the right baby monitor for them. For that reason, we at 10giants decided to dig deep into the market and actually split the best baby monitors that you can buy in 2019 into 4 main categories. We will walk you through them by not only showing what’s good, but also talk about the cons of each and every product of the category you are going to choose. We select products based on different things and factors. Factors like product reviews, the total number of sales, how many people are reporting and giving feedback ,whether it’s negative or positive feedback related to the testing of that product. The first category that we mentioned is the old-school sound monitors, if you’re trying to buy a monitor, nursery monitors or sound monitors are probably going to be the most common traditional ones. With that being said, let’s go into some pros about these types of monitors and which are the top baby monitors in this category. So the best thing about sound monitors is that there’s no lag in its instance, what you hear is what you get. And they come at a very cheap price. Now the obvious con is that you can’t see the baby, and if that’s something that you really want then it’s probably not going to be the best option for you. In our testing, we’ve been using the VTech safe and sound dm2 21. which we’ve been pretty happy and satisfied with, it was a simple buy on Amazon, VTech seems to have the best options with only the sound feature on Amazon. We don’t really intend on testing any others, but we’ve been pleased with what we’ve used and how the product performed. Firstly, the VTech baby monitor is really cheap, if you’re looking for something useful and not expensive and you also don’t need a video to see your baby, this simple device will have you covered,additionally the batteries last for a decent amount of time,this kit also comes with two cables of about two or so meters long,they’re a pretty good length. Essentially what the first kit does is it listens to the baby, it also can be a nightlight. It has a volume control and sensitivity settings, so you can set the sensitivity of the listening part, and that way you’ll be able to know if the baby is far away or if it’s right next to the device. It can be heard from a good distance and also has an option to be silently alerted when vibrating thanks to a couple of volume settings. it’s really good and does quite a bit for just a simple device. Moreover, the battery life could last at exactly 17 hours so it’s pretty good if you use this over two days, for example, eight hours a day for two days, it would manage just fine, and also just to point out there are two charging cables. Finally, you can charge both devices at all times if you are in your kitchen and you just always have a plugin you never have to worry about battery life. Overall this device is a great choice for those looking for a budget-friendly and simple baby monitor that does the job. The next category has really grown in popularity, it is video cameras that come with an app so that your phone can serve as your main monitor. Some of the best brands in this space are Nest, Arlo and we would also add Amcrest into the mix. They’re traditionally security brands that have really branched out into the baby-making spawn to the baby space. 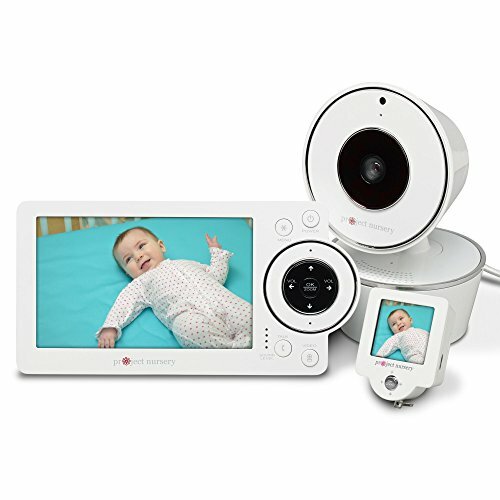 Let’s go ahead and dive into some of the pros of these kinds of devices and some of their exclusive features before reviewing the top 3 baby video monitors. In our simple professional opinion, these cameras offer better quality & better features and they have recording capabilities. You have to put in mind that a lot of these brands identify primarily as security brands, not just traditional baby brands, they basically emphasize security a lot more as we stated before, but noticeably the thing that took our attention about running with these cameras, is that they have a life after a nursery typical brand, like Motorola or baby sense or something of that sort. Once you’re done using them and you don’t really know what to do with them, you can simply just donate them, or you can use them for the next baby, they kind of just sit there when you’re done using them. However, by buying a camera from Nest, or example, you can go ahead and use to monitor your other rooms, or your garage, or your living room. It can continue its purpose as a security camera, and actually, monitor a different part of the house with so many great features. There are some things that you do have to look out for, the first thing is going to be the price. Obviously, there is kind of a high barrier price for an option like this. The second thing is that if you want to record to a cloud or go into any sort of their services it’s gonna be a bit costly. At the offer with master Arlo, there is a subscription fee on a month-to-month basis, you’re gonna be paying anywhere between ten to thirty dollars depending on how much storage you want to pay for. Some of the cameras like Amcrest do offer to record natively to a micro SD card, which is great, but the cost is going to be something that you do have to look out for. The other big downside to this option is that we wouldn’t recommend you using your phone as a constant stream, some parents like having their phone perched on a desk or something like that, thus they can always have an eye on the baby, this option is more for those who just want to poke in and just kind of see how the baby is doing. coming in and out not for constant dreaming if you do want a constant stream. It’s gonna slay your battery and you might need some sort of external battery source. If you’re going to be using the Nest cam baby monitor, the first thing you need to know is how super easy it was to set up the camera, it’s designed to be plug-and-play, with Wi-Fi control. Although it has a big warning tag on the end that can be a bit annoying and an eyesore. It specifically says do not remove this tag, but you can still remove it. But putting it in a nursery could be a strangulation hazard. The camera is flexible even and you can use it like a magnet and a pretty strong magnet we might add. Furthermore, the box comes with a mounting plate and screws, all you have to do is screw the plate to the wall, remove the sticker and simply then attach it. The next important thing to know is that you can’t really pan or tilt within the app, so you definitely want to make sure to install it in a corner or somewhere up high in order to be able to see the whole room. In addition,it does have a130-degree wide angle which helps a lot. Now the infrared lights aren’t too bright and it’s kind of hard to capture them in the room unless it’s completely dark and it’s not brighter than the average night light. When you’re reviewing, the footage is nice and high quality, and it’s really easy to use the timeline. As far as storage goes, you start out with a free 30-day trial of messed aware, which is their cloud storage plans, after the 30 days of trial, fees go up from there. you can pay $10 a month for 10 days of storage or more per month, its safe to say that we don’t like the monthly fees option. However, we can totally see what people would pay for this very easy-to-use product. Last but not least, there’s a three-hour look-back period but all that you can see are snapshots and you can’t actually see any footage. The Arlo baby is arguably the best Wi-Fi baby monitor on the market, but the main questions that we should ask ourselves before getting it, is it worth the high price they are asking for? and how does it compare to cheaper options like the others. Arlo has been a big name in the home security field, and now they’re making their way into your babies and nursery. The first generation of their baby monitor manages to be quite cute, with some green accents on the top and bottom, but under the hat, it’s still rocking that black and white Arlo brand identity, and notably it kind of looks like Eve from wall-e.
Out of the box we’re looking at the camera fully dressed, a Quick Start Guide power and supply cable and wall mounting accessories, Subsequently the camera is pushing 1080p at 30 frames per second, night vision up to 15 feet,and has an adjustable field of view, from 90 up to 130 degrees,which is very unique, but it’s not all good in the hood, because what this thing lacks, is pan and tilt capabilities. You might not need that for such a wide field of view, but some might want it to set up the camera. Additionally, you can use Arlo with the Wi-Fi to access the live video feed from anywhere in the world, and you don’t have to be in the same house, which is great. But the main selling points for Arlo baby are largely centered around its monitoring capabilities because this device offers both motion and sound detection. If either the baby starts crying or starts moving in the cameras field of view, it’ll shoot you an alert to your phone email and start recording short clips of what is happening. If the alerts get annoying which they certainly did for many users,there’s an option to limit how many notifications you get because the alerts get triggered by a variety of things, including small things like when you change your baby’s diaper or if there’s construction noise outside, which we’d say is a little unnecessary. There is also the auto-recorded event clips, which you can access in your library for zero dollars a month, it’s free and you can get up to one gigabyte of cloud storage, hence you can check events that occurred even up to seven days back and review the footage before you lose it. If you’d like more storage and recordings you can buy one of the subscription plans that start around $10 a month or $100 a year. Eventually, when it comes to the app and some of the extra features on there in addition to being a monitor, the little baby doubles the nightlight and sound machine effects, and the app installed within the device can toggle light colors and brightness, as well as play through a variety of sounds for the baby, it’s somewhat limited, but it does have a good selection of music and ambient noise. Also, note that both the music and light functions can be activated by the buttons on the side of the camera. 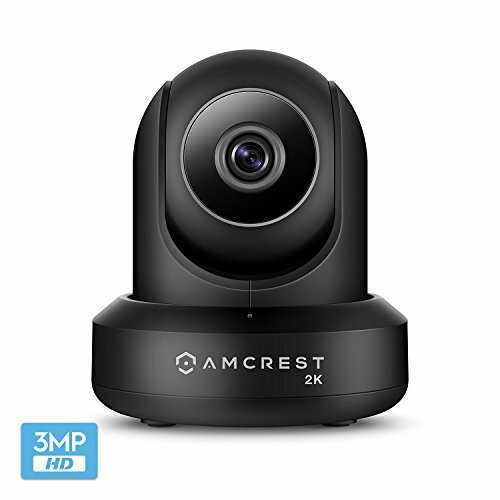 The Amcrest Pro HD has two outstanding and modern features, the first being two-way communication and the second is the night time vision. Also, a pan and tilt digital zoom, motion alerts, micro SD and cloud storage, as well as being easy to set up. It’s one of the best sellers on Amazon, thanks to the whole host of awesome features that make it work really well for parents and caregivers, who want to keep a protective eye on their family at home.P lus the ability to hear your baby or toddler when they stir it and being able to talk to them. We all know what it’s like to have to go to work and worry about leaving your little ones at home, in the care of someone else. So it removes a lot of the guilt and stress when you can talk to them yourself and soothe them if they’re upset, with two-way communication exclusive feature, you can even sing them a lullaby to help them drift off to sleep, or chat to your partner while they feed your baby in the nursery, all while you’re away at work or even overseas. Moreover, with 12 IR LEDs in a massive 32-foot night time vision, you will have no problem picking up any motion within the camera’s range. This function is great for when you have to work lateة or if you’re in another time zone. 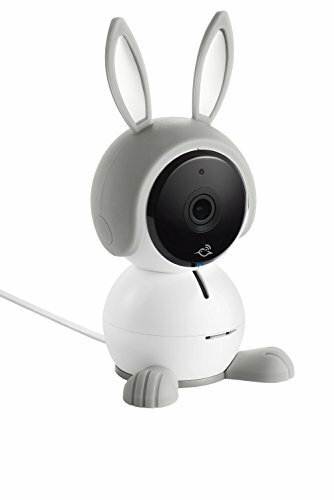 You can watch your little one sleeping knowing they are safe, the wide viewing angle is great with the 360-degree remote pan and tilt that take it to a whole different level. You can follow your toddler as he/she scampers around the room, or follow your partner as they move around the nursery. You can also keep an eye on the babysitter when you’re not home with an intelligent digital zoom in full 1080p video. In addition to all of that, you can upload your video or images to an FTP server too, as well as record to any ONVIF compliant network. Whenever the cam picks up motion. you will receive an email alert on your mobile device which includes a snapshot of the motion, there are no sound alerts with the Amcrest cam. In conclusion, the setup is quick and easy, there’s a Quick Start Wi-Fi setup where you scan the QR code, eliminating the need to access your router, and set up port forwarding. This makes using it by your smartphone very easy, the system is also fully compatible with the blue iris software. There’s also a lifetime of support from Amcrest, which is uncommon in the surveillance cam industry, most companies just make you pay for support after 12 months. The number three option is a video camera that comes with a dedicated monitor, this has been a very popular option for a lot of parents who do want that constant stream, So that enables them to see, hear, and even talk to the baby through that dedicated monitor. Some of the brands are even stepping up the features by telling you other metrics, like air quality and room temperature. So what are some of the cons of this option, in our opinion, we never really been happy with the quality of any of those cameras. With the standalone monitors, the frame rates are always so choppy and the quality is just terrible. Even though they boosted it to 1080p, some of them are still behind on the only 720p and it feels like they’re not really making the push, or the advancements that new millennial parents like ourselves really want to see out of these traditional baby brands. Nevertheless,the Motorola and project nursery are turning out to be some decent cameras. One of the best options on the market for the third available choice at under 200 dollars, with that being said let’s jump right into the pros and cons of this product. The number one positive thing is it has a nice three and a half inch full-color screen. Giving you nice sharp details, this device allows you to see everything going on around it, even though it does not function over Wi-Fi, meaning that the signal that you’re getting is isn’t live,but there’s no delay and there’s a much smaller chance that an outside hacker breaking into what you’re watching. Now let’s run you through the cons. For starters, there’s no sensitivity control, which means if you are putting this in a room with your baby, and there’s a white noise machine to put your baby to sleep, guess what? you’re also going to be put to sleep with a white noise machine because you’ll be hearing that same signal. In addition, people online have complained that it is difficult to install but that is simply not true, there’s a thumb tech that enables you to put the thumbtack on the wall and set up your device. Lastly, its installed menu is a little bit janky, with all the buttons being on the side. From our perspective, this seems like a dumb idea considering it’s 2019, incorporating a touchscreen which makes life a lot easier shouldn’t be that big of a deal. 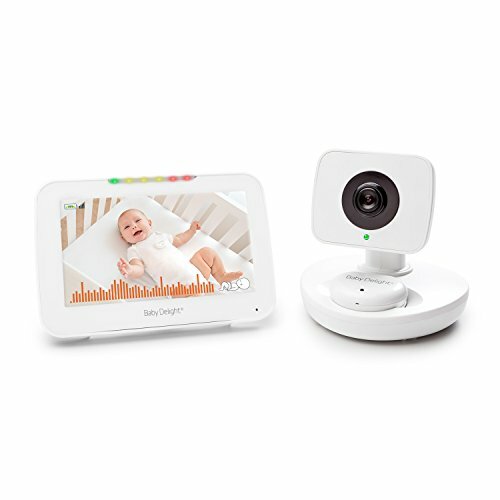 This is a smart Wi-Fi baby monitor, which comes with just a camera that connects to a project nursery app via Wi-Fi, and turns your smart device into the parent unit. This baby monitor also works with Amazon Alexa, allowing parents to control the camera with their Alexa enabled speaker. Alexa Could take a picture with the nursery camera, this smart device and Alexa device are sold separately pleated. Once you have the camera set up, either on a flat surface or to a wall using the included mounting tools and the camera is synced with your smart device. You’re ready to start keeping an eye on your baby, the project nursery app has a variety of features, from panning and tilting the camera, to recording video and taking photos. If you need a two-way communication with your baby just press the speak button, and you can see your baby without needing to go back into the nursery. The camera can also play three lullabies – nature sounds and white noise just use your baby. Furthermore, you can also set up motion and sound notifications on your phone when the camera detects movement or sound from your baby as well as the temperature alarm. If your baby’s room gets too hot or too cold there’s also a night vision option to configure the cameras infrared light for viewing the nighttime video. will also be very convenient for families who use Alexa, so that’s really what this baby monitor provides,it definitely has some great features. Many if not all parents value the health and well-being of their babies, therefore they try to make sure that their babies are in a safe and trusted environment by keeping them in their sight. Taking this into account, this is why you should consider buying a baby monitor if you’re a parent that loves their offsprings and wants the best security for them. Nowadays most parents found comfort through these high-tech baby monitors, because not only do they provide a way of communication and remote video surveillance for babies, but they also give parents peace of mind by knowing that their babies are on their radar. We can go as far as saying that these devices can have lifesaving benefits in some cases. Old-school monitors such as sound monitors still do a fairly good job, but sometimes they can be inconvenient and in some cases just not enough. For that matter, some manufacturing companies have risen to modern life challenges and demands to bring you some astonishing high-tech attributes. These modern day devices are equipped with the latest and most advanced features, such as live video and sound transmission, or night vision which enables you to see your baby at night when you’re traveling overseas and you’re a different timezone. They also have movement sensors that can be installed in your smartphone and synced with your device, the latter will send a notification to your phone whenever your baby decides to make a move. In addition to that, some baby monitors can even monitor your baby’s breathing, temperature, heart pulse, and blood pressure thus giving you a perfect idea about your baby’s health. Just like any other product in the market, baby monitors differ from one to another hence why you ought to pick the one that is optimal for you and your child, considering many factors such as price, performance, and storage capacity. With that being said, if you’re someone that stays or works at home you might be better off going for a budget-friendly monitor with low storage capacity, as you will occasionally leave your baby home alone and a huge storage is not needed. However, if you are some with a busy schedule, travel a lot and you barely stay at home, that’s when we strongly recommend a high-performing monitor that might, unfortunately, cost you a good amount of your hard-earned money, but will definitely get the job done. There are also good options for those who are running on a tight budget and still want a trustworthy and decent overall monitor at a reasonable price. So it’s up to us to review these products and give you the feedback you need, and it’s entirely up to you to choose, so pick wisely and according to your needs.